What would you do if a colleague or family member was experiencing severe chest pains, or collapsed? It's a lot easier to enjoy sports when you're doing them safely. We can help you get peace of mind. There's plenty of opportunity for accidents and problems at work. We can help you prepare for a huge range of eventualities. As Britain's roads get busier and busier, are you prepared if a passenger or driver is injured whilst driving? Life Saving Courses are just a click away! If a family member, friend or business colleague collapsed in front of you, what would you do? Make them comfortable while they recover? Call an ambulance? Panic and scream for help? A short first aid course with Guardian First Aid would give you the knowledge to make the right decision. Confused about what course you need? Guardian Training provides affordable training and advice to businesses, schools, sports associations and individuals in Milton Keynes and the surrounding area. Barbara Cherryman is the owner and Director of Guardian Training Ltd. She is passionate about passing on her skills ever since First Aid saved her life following a serious accident on a Greek Island in 1985. She is immensely proud of having trained thousands of people to save lives since 2002. She is also the creator of the First Aid Cabinet. Our highly qualified staff are both experienced and personable, ensuring you receive the only the best quality training from our friendly and understanding team. 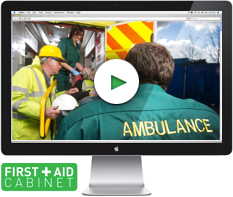 Visit our great new online learning resource, First Aid Cabinet - where you can learn everything you need about First Aid for Children, all in one place! The UK’s leading, most comprehensive, online resource including over 30 videos. Learn what to do in any given emergency situation involving babies and young children. I would just like to say what an excellent job Paula did for the two day Paediatric First Aid Course which I attended on Monday 10th and Tuesday 11th June 2013 . Paula ran the course in an informative manner keeping everyone's attention with humour and her own personal experiences as a paramedic, mother and friend. Questions were answered and explained in a way which I understood and I came away confident with the knowledge I had gained. This course was excellent particularly because of the way it was delivered. Thank you so much and I wish you all well. First Aid course was fantastic. The trainer made the day much more enjoyable with her approach to training and making it so easy to take in. What is a really serious subject was extremely well presented and the facilitator made it entertaining and enjoyable, but also presented it in such a way that we could "take it all in". The practical element, especially the choking (which I have never done before) was excellent. A great course and delivered really well. Educational as well as extremely useful. Highly recommended. Brilliant First Aid training. Best I've ever been on. Lots of info in a very understandable way. Will recommend to others for sure! Excellent course. On target and appropriate. I would recommend it to anyone. What an engaging and informative tutor, combining information with humour. Best training course ever! And I have been on plenty! Informative and made enjoyable... Defibrillation was very well instructed, it could save a life. Well presented... Very impressed with the course... Excellent and informative tutor... Very good and relaxed training, delivered at the right pace. Well done! Everything was brilliant and I particularly liked the additional in-depth details. Brilliant and relaxed presentation with extensive knowledge. Thanks very much! I liked the way it was all explained (not boring)! The tutor was wonderful, with the right balance of humour and seriousness. The tutor was very good at talking to the students and answering questions. Excellent course - thank you! Great fun and made it much easier to remember by hearing real life experiences. The tutor's knowledge was fantastic and really informative. Fun to learn as well!